The upper-intermediate’s students had to read “Man from the South and other stories” and I must give my opinion about it. Was the book brilliantly funny and unforgettable? In my opinion, the book was funny to read but not brilliantly funny. Firstly, not all the stories are good. I found “Pig” and “The Vicar’s pleasure” very interesting but the stories “Man from the South” or “An African Story” are strange and, in my opinion, the dog’s death was hard for me. I’m very sensible about animals. In addition to this, the end of “The Vicar’s pleasure” made me laugh a lot, but, I think, we would need to know what happened when the “Vicar” saw the commode after being destroyed by the three men. Secondly, not all the stories have an original argument. From my point of view, “The Landlady” has a final that we know previously, like a film in “Antena 3”. Why did not the young man run away when he saw the strange things? Instead of this, he drank more tea! The dog and the bird were dead, are these things not strange enough? On the other hand, I think this book will be unforgettable because when we see a pheasant or raisins we will think in “The Champion of the World” and we know how to catch them! To start with, I’ve found the book a bit strange because its stories were too fantastic and incredible. Anyway, the plots of the stories were quite easy to understand and fast to read. Although the things that happened were completely senseless, I enjoyed reading them. Of course, they’re afternoons’ readings due to the fact that they are too scary for the evenings. Firstly, the stories weren’t funny at all. In fact, the writer is really cruel and there have been murders and deaths along the whole book. The most disgusting of all was, without any dough, that one in which the main character, a young boy, was killed in a factory at the same time that same pigs to make food for people. From my point of view, the author is trying to make a joke from a serious theme. It doesn’t seem to me as if death was an issue to make a comedy with. Secondly, I agree with the sentence, the stories are unforgettable because they really surprise you while you are reading. That is surely because we have never read something like that before. To sum up, I thing this is a good book to read if you like to be surprise by a book. But I would rather read a good novel instead of those short stories. In my opinion these seven stories are at the same time a bit frightening and brilliantly funny, so I agree with the statement. Firstly, I believed that these stories are a bit frightening because in many of them there are murders or people who die. For example in “Pig” or “The Landlady”. I think that these two stories are the most terrifying. Secondly, I think that other stories are very funny because the persons are too silly in many situations. For example the story about the hunters who caught pheasants with raisins, as well as the story of “The Vicar´s Pleasure”. These are strange stories, although in the end both are funny. In conclusion, I believe that this book is interesting for many different people because there are a lot of different kinds of stories, and when you are reading, you can feel terrified, stunned or confused. I really agree with this opinion. It is not only a funny or a mistery book, it´s more than that. Reading the stories, you can´t ever imagine what is going to happen, or how there are going to finish, so the person who´s reading them can´t stop doing it until he (or she) has know the end. One of the stories that I have enjoyed a lot is called “The landlady”, where we can read a very unexpected end. We couldn´t have imagined that the woman stuffed all her clients! But this book also makes you think, like in “The vicar´s pleasure”, where we have to think if the commode should have been broken to give a leasson to the vicar, who wanted to became rich trying to buy people´s good furniture without telling them their true value, or if this end was only very bad luck for the vicar. We can also read about a crime, like in “Pig”, or about a strange bet on a Cadillac and a cut finger, like in “Man from the south”. Finally, I would like to say that if you want to have a great time and enjoy reading a book whose writer is considered one of the best mistery writers in the world, please have a look at “Man from the south and other stories”. 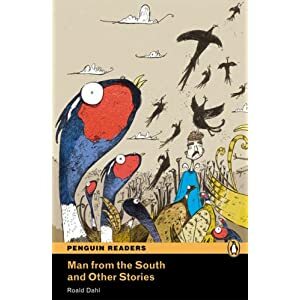 Man from the South and other Stories is brilliantly funny and unforgettable. I recommend this book because it´s very easy to read, although it´s for advanced level. Some stories were funny, like in Man from the South, where and old man and a young American sailor bit that the sailor could win a car or lost one finger, or when in the last story, two poachers hunt pheasants using raisins and pain back´s drug. Other stories are unforgettable and a little awful, like Pig. It´s about a child who lived with his aunt because the police killed his parents when they were coming by the living room´s window. The police thought that they were robbers. Finally this child was killed like a pig… Also the story about a woman who stuffed pets and young men is really terrifying. All stories had one thing in common. When you finish a short story you must think and remember all the details that the writer mentioned, because he was teaching that nowadays only clever or luckily people can be saved. In my opinion, this book is very entertaining and you must read it if you want to spend a good time. The title of the book that I read is A PUZZLE FOR LOGAN. The author is RICHARD MACANDREW. It is a detective story. Two police officers in Edinburgh, Inspector Jenny Logan and Sergeant Grant, investigate the escape from prison of the murderer Ronnie Campel, who killed Craig Sinclair seven years ago, and the death of Morag Machenzie, who is the person that made the police think that Campel killed Sinclair. Finally, they discover that the murder who killed Morag Mackenzie and Craig Sinclair is the same person, Robert Baxter, who is a businessman and a hard criminal in Edinburgh but the police have never caught him. Jenny Logan, who is an inspector in the Edinburgh Police. She has short brown hair and dark brown eyes and a long nose. She is a pretty and an intelligent woman. She works hard but because she is good-looking, people don’t always take her seriously. Sergeant Grant, who is an officer helping Inspector Logan. He is fifty-nine years old but looks younger. His hair is thick and black and he has a large black moustache. Both discover who is the murder. I liked the story because I was intrigued until the end of the book. I think that the best part of the book was at the end when Mr. Maxter, after Jenny Logan had believed him, she found a man who saw him leaving Sinclair’s body in the place where the body and his car were found, told the truth and recognized he was the murderer. The story made me feel thrilled. The new things that I learnt from this book were the new words and expressions. I recommend this book because it is entertaining and the story is nice and interesting. This is a book from the publisher Cambridge University Press. 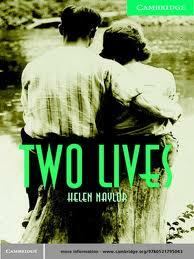 The novel tells a love story between two teenagers, Huw and Megan who live in Tredonald in Wales, around the year 1946. They fall in love but he goes to Canada so that his father does not start drinking or suffering again. And they know nothing more of each other. He sends letter to her but her father does not let her see them. Fifty years later they know something else about each other. Huw discovers he is a father. Huw comes back to Tredonald to meet his daughter. Megan is getting married to Paul, but at the end she will marry Huw. Huw Thomas: he is 16 years old. He lives with his father, David, and his brother, Gareth. His mother died when he was younger. He works in the mine with his brother but he studies too. He goes to Canada so that his father does not start drinking or suffering again. Gareth Thomas: Huw’s brother works and dies in the mine. David Thomas: Huw’s father drinks and spends all the money on it. Megan Jenkins: a sixteen-year-old schoolgirl, works in the family’s shop in the town. Beth Jones: Megan’s daughter lives in Cardiff. Philip Jones: Beth’s husband likes golf. Mike: Huw’s son lives in Toronto. I love this story because the plot is the best; it is a story that grips you. The best part is at the end when you know with whom she is going to stay and the worst part is when they are separated. This story almost made me cry. This story made me learn new words that I didn’t know. I recommend this book because the love story between Huw and Megan is very interesting because you do not know how it will end until the end. 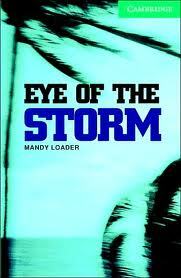 “Eye of the storm” it’s a Mandy Loader’s book. She is a writer and she was born in U.K. She has written numerous language books and courses, but particularly enjoys writing readers. This book is a romance and fright novel. It’s a funny and curious book, about love and the power of the force of nature, and how this force changes the life of the characters who appear. The principal event of this story is a terrible storm that menaces the coast of Miami and the people who live there. Ikemi: she is a young girl who lives near Florida Beach, in Key Biscane to be precise. She is in love but sad because her father does not approve of her relation. Hiru: he’s Ikemi’s father. He’s a widower and he’s very worried about Ikemi. Fishing is his favourite hobby; while he’s fishing, he forgives his problems and also forgives the death of his wife. He doesn’t approve of Ikemi’s relation, and he’s a very obstinate man. Max: is Ikemi’s boyfriend. He is a funny and good person. He loves IKemi very much, and he is a boy who works very hard. He goes to flying classes at the flying school. Ross Peters: he’s Max’s teacher at the flying school. He is fond of Max because he thinks that Max is a boy who works hard to get his dreams and illusions. Rick and Elaine Bridges: are a married couple who live in a flat with their two children, and they fight against the storm for their lives and the lives of their children. The story begins when Ikemi tells Max that she can’t see him again because her father disapproves of their relation. The next day a storm comes to Florida while Hiru is fishing in the sea. Ikemi is very worried because her father doesn’t answer her calls. Ikemi finds Max in the marina, near the beach, and then they go to find Hiru on a plane that is the property of Ross Peters. The book is easy to read and it was an exciting and entertaining story. My favourite part of the story is when Ikemi and Max are in the eye of the storm. In my opinion, this part is really well described, because we don’t know how it will end. I would recommend reading this book, because I think that it is easy to understand and it lets you have a good time reading it, and in my point of view, this type of books can serve us to learn more easily. Seleccionar categor Advanced Blood from a stone Boy Boy in Striped Pyjamas Fasting, feasting Fifth Business Frankenstein Frozen Pizza Harry Potter In my sister’s shoes Leaving Mother Lake On Chesil Beach Queen Camilla The Curious Incident… The Ice Princess The Millenium Trilogy The White Tiger Book reviews Elementary Amelia Earhart K’s First Case The Secret Garden Two lives General Intermediate Amelia Earhart Deadly Harvest Diary of a Wimpy Kid He Knows too Much In the Shadow of the Mountain Man from the South Murder by Art Night without end The Grapes of Wrath The Sugar Glider This Time it’s Personal Tooth and Claw What’s new? About reading. Hosted in Educastur Blog.